The Dole horse is a native of Norway, and until recently not found in the USA. Tangle Tree Ranch in North Dakota has introduced them, and their site has lots of interesting info and nice photos of this unusual breed. Dole horses are a light draft breed, and have some similarity (in appearance, not necessarily genes) with the Canadian Horse, Irish Draft, Highland Pony and other stocky northern breeds. They are traditionally prized for logging and other draft work, but are now popular for all around pleasure riding and driving. This German draft horse is wearing a halter of a type I have not seen before: the cheekpieces and lower portions are all made of decorative chain links. This is not a design used to discipline the horse (as some people might be familiar with - such as using a chain looped over the horse's nose to control it). The design of this halter would not apply any pressure with the chains; in fact, the two parts of the halter than exert pressure on the horse are made of wide pieces of leather. The chain here is purely ornamental. A bit Medieval looking, I think! Photo: Little Sara on flickr. 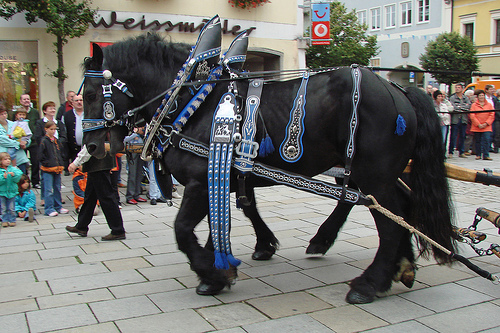 These Bavarian draft horses are wearing a fantastic dress harness (something so fancy would never be used for daily work, only for parades and shows). The black leather is decorated with large pieces of silver and the edges set off with blue trim. One of the most beautiful harnesses I've ever seen! Be sure to visit mhobi's photostream for more views of these horses. Update: here's another Bavarian team on flickr. This funny home movie shows the usefulness of draft horses in unexpected situations. I won't spoil it by telling you more than that. This beautifully made 10 minute film shows the old-time method of logging using draft horses. Horses do less damage to the forest than motor vehicles, and the slow, quiet work in the forest is pleasant for both humans and animals. Update: here is a similarly lovely video about logging using the Ardennes breed of draft horse, in France. Video is in French with German subtitles. Friesians are a light draft breed, traditionally used in harness, though they have gained popularity in recent years as riding horses. Here is a video of Friesians in competition in the Netherlands, showing off their high-stepping, fast trot. Harness horse breeds typically excel at trotting, as that is the best gait for pulling a cart (vehicle with two wheels) or carriage (vehicle with four wheels). Some breeds of horse traditionally have their tails docked. This means that some portion of the actual tail (the bone and muscle part, not the hair) is cut off, leaving a short stub. The hair that grows from the docked tail hangs down a bit, but is no where near as long and thick as it would be if the tail were not docked. 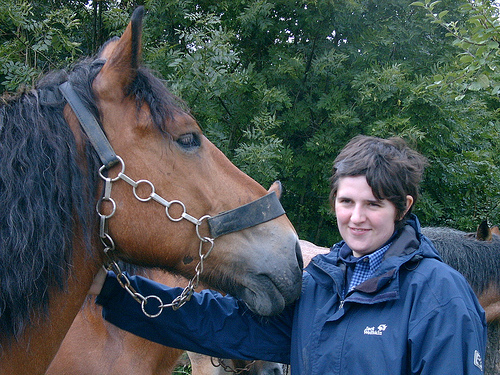 Docking is not terribly common, but when it does occur is most typically found in draft horses and a few other harness breeds, such as the Hackney, and usually only in horses used in the show ring, not working farm horses. The original point of docking the tail of a harness horse was to prevent the rather dangerous risk of the horse swishing his tail up over the reins, which results in a sort of horse "wedgie", which leads to the horse frantically bucking to get the rein out from under his tail, causing mayhem and injuries all around. However, the same protection can be gained by braiding and wrapping up the horse's tail (as is often done by competitors in combined driving events these days). Braiding and wrapping the tail also allows the horse to have his full tail back again after the event, so that he can enjoy using it to swish flies. Docking is thus mostly a tradition or fashion, not a necessity. Oddly enough I have seen Hackneys in the show ring who have docked tails, but are then shown with a tail wig, so it looks like they have a really long, lovely tail. The photo shows a row of Belgian show horses with docked tails. The one nearest the camera has the hair hanging loose. The others are braided up for the show ring, and you can see how short the tail stub is. 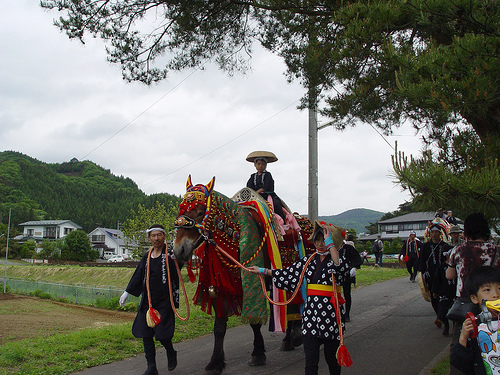 This is an awesome picture of a draft horse decked out for blessing at a shrine in Japan. What a delightful costume. This stunning Shire mare is a sabino. Her basic black with four tall socks and blaze is overlayed with a roan that looks like it's been spray-painted on from below. 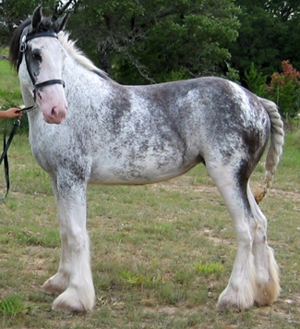 It's not uncommon for Shires and Clydesdales to have some roaning or jagged white spots on their bellies or flanks, but this horse has unusually extensive sabino characteristics.